Early this year I bought the Asus GL553VD, a budget gaming laptop that is also a capable video editing machine (here is my full review of it). 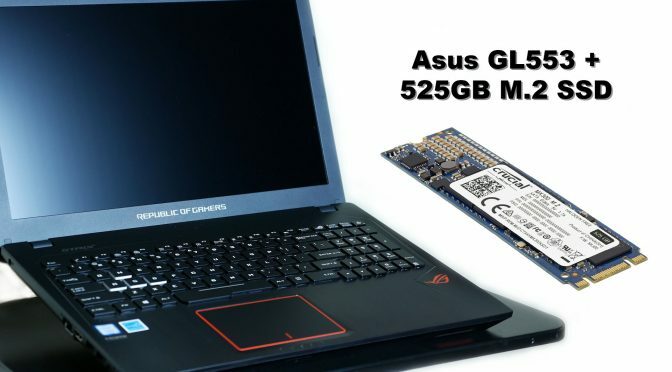 I really wanted a laptop with a spacious solid-state drive, but rather than buy a computer with such a drive, I chose a model that is easy upgradeable. This way I could get what I wanted, without breaking the bank. In the video below, I show how I installed a m.2 SSD in my Asus laptop (which is very simple), and how I migrated the operating system (Windows 10) to the new drive (which is more challenging). If you have booted successfully from the SSD and confirmed that all files copied from one drive to the other, you can then (and only then!) format the 1TB HDD (this is what I did it in the video; it’s my “Data” E drive; make sure you do not format the SSD!). I use the HDD for footage, documents, etc., and I use the SSD for Windows and all applications. Here is info on how to protect yourself from an electrostatic discharge. Previous Post$135 PRO Camera Car Mount!Next PostFilm Shoot Tested! Aputure Deity Condenser Microphone – Is it good? Bought same laptop few days ago and wanted to do same thing as you 🙂 Wanted to ask about SATA ports, as I know HDD uses SATA and this type of M.2 SSD also uses SATA. At the end of the video it is noticable that you are using HDD and M.2 SSD at same time, so my question is – is there any performance drop(speed of read/write etc.) of HDD after this upgrade ? at 5:29 of the video you can see the test results for the two drives. Also, in daily use (almost a year now) I have not seen any drop in performance of these drives. Hey there. I want to install an m2 on my asus gl553 and I don’t have a bolt/screw. Can you please tell me what size 2mm or 3mm. I cannot figure it out by looking.